All of the new biology graduate students are required to take an ethics class. I think, on principle, this is a good idea. Unfortunately, I feel like the class is a big waste of my time. -We get lectured at for an hour late in the afternoon when all my body wants to do is fall asleep. It is not an interactive class. I wouldn't mind it if we broke up into small groups and spent part of the class discussing ethical dilemmas. Unfortunately, we've only done that once. He spent a whole hour talking at us about plagiarism. Surely he could've found a more effective teaching method. -On the syllabus it said we were required to buy two books that we have NEVER used. One of them is on biomedical ethics so I plan to resell it asap. -The guy doesn't speak loudly enough unless you're sitting in the first two rows (and it's not that big of a room). -He doesn't know his audience (or at least not my demographic of it). There are many ethical issues that transcend disciplines but some are much more specific. During the last class he spent the whole time talking about lab notebook protocol and intellectual property rights for patents. Nothing I can possibly foresee doing with my field notebook will ever result in a patent. This is just one example of the fact that he has never acknowledged that there are some of us in science who don't work in a typical "lab" with "lab experiments" and "lab notebooks" and I think it's because he doesn't know because he has never once in the course asked what kind of science we do. My research has nothing to do with medicine or industry. I don't even know what other departments people in this class come from. -If he knew his audience, it wouldn't take much modification of his lectures to pitch things to the field ecologists and the other unaddressed scientific disciplines in the room (if there are any). I just feel like so many of the topics discussed in this class had absolutely nothing to do with my research (such as the ethics of dealing with human research subjects or lab rats), yet no one ever attempted to acknowledge this. It would not have taken much to include us in the conversation and convince me to care a little more about the ethics of lab notebook protocol. I am going to be sorely disappointed if I do not get to fill out an evaluation for this class. This week I taught my last lab of the semester. It sure did go by quickly! I prepared a little 'thank you' to my students and told them to feel free to come talk to me and let me know what they're up to since I'll be here at least as long as they will be. A few people's eyes bugged out when I told them my Ph.D. program would take 5-7 years. For some reason though things felt awkward with my first lab of the week. It was still hard to get them to volunteer answers for my questions and things just felt weird. Not what I hoped for my last class with them! I am always a little less polished with them so perhaps they were feeling bad because they gave me less than glowing evaluations or something? One of my students from that lab (the one who wants to be my Facebook friend and invited me to a Halloween party where he was really drunk and tried to tell me that because he invited me to the party that I was supposed to give him 100's on his lab reports...) said as he left, "Well, it's been an interesting semester. I'll leave it at that." What does that mean? Oh well. My second lab was much better. I'm usually better for the second lab because I've been through the topic already with my first lab and made my mistakes with them. Plus, this week we were studying plant reproduction. I actually got to talk about my research! I really knew this week's topic because, frankly, I taught quite a few classes on flower anatomy and seed parts to first and fifth graders at Mid-Atlantic Field Station. A couple of women in my class really lit up when they realized that when they eat seeds they are eating the "lunch for the baby plant in the box." We also talked about why peanuts "split in half like that" when you open them. I think they'll remember now what a dicot is. It's so rewarding to watch students "get it." At the end of my second lab a few women, including some of my older students, thanked me and told me they'd be surprised if I got any bad evaluations. It made me really happy to hear them say that. I hope some of them do let me know what they're up to and come to me if they have internship or career questions. A few weeks ago one of my students interviewed me for an assignment for another class about careers in biology. It was so exciting to talk about the possibilities! Another one of my students (from my first lab) came to talk to me about her interest in plants. She is a first year but really seems to have her act together and have good self confidence and communication skills. Her plan is to go to pharmacy school and so we talked about medicinal plants and how plants and pharmacy were a great combination of interests. While I was working at Mid-Atlantic Field Station I saw an awesome presentation by a professor of pharmacy who teaches herbal remedies to pharm students so I gave her his name. She also wants to study abroad! I really like this student and I hope she finds some great opportunities. This week in my required grad course we talked about issues of gender and ethnic diversity in academia and ecology specifically. We had a visiting speaker who is one of a handful of African American ecologists. She said she thought the most important thing for increasing diversity in science is mentoring. I think everyone who is passionate about what they do can identify a mentor who encouraged them to pursue that interest and coached them through life's hurdles. I certainly have many, many mentors to thank for getting me this far in science. I hope that I can similarly assist students in navigating the road to a life in science, especially students who come from different backgrounds and possess unique insights and perspectives. I have to say that's something, among other things, that Herb appears to do quite well. He has definitely put his money where his mouth is when it comes to recruiting and advising students from diverse cultural backgrounds. I have more thoughts on teaching as the semester wraps up but I'll save them for a later post. I should probably be working on my review paper, but I just got excited about an idea for next spring: Seed bombing the potential green spaces in my neighborhood. Let me explain. Seed bombing is the practice of making balls of soil and seeds and tossing them into weedy, vacant areas for beautification (or food production). I heard about this on NPR last year, but was reacquainted with the idea at Worldchanging.com. I mentioned in an earlier post that I'd love to find a local community garden to join next summer. However, even if I don't, I have a plan. I'm going to add some variety to the local weedlots. In particular, I want to plant squash. Winter squash. I love winter squash. It's relatively easy to grow (in my experience) and keeps for months. I bought a calabaza squash (it looks like an odd-colored pie pumpkin) at a farmer's market in September. It had a growing brown spot, so I knew I need to deal with it this weekend. I sliced it up into wedges like cantalope and baked it with the skin on for about 50 minutes while I had a casserole in the oven. I couldn't believe what a beautiful, bright orange the flesh was when I took it out! It separated easily from the skin and wasn't stringy at all. It was also delicious all by itself! I pureed it and will freeze it for later use in a pumpkin pie recipe because I think it will have an excellent pie flavor. Anyways, I initially saved just a few seeds in hopes of a community garden plot next year but after reading about seed bombing I salvaged the rest of them. There is quite a bit of weedy railroad right-of-way near our house that I think could grow some calabaza squash. I can do preliminary site scouting from Google Earth. If it doesn't take, oh well, no loss. If it does, I might have more calabaza next fall than I know what to do with. Or the neighbors might enjoy it. Or the rats. I would also love to seed bomb some hardy, colorful annuals into the local fenced-in vacant lot. It is rocky, weedy, and trash-filled so I don't think it's really worth trying to grow squash there. Like I said in my earlier post, I usually tend towards being a native plant snob but I just can't be picky in Big City. Anything green and growing is an improvement for air quality and people's quality of life. That said, I don't want to spread any new invasive plants so they are out of the question. I'm thinking zinnias, marigolds, and native sunflowers-sunny things that won't grow in front of our north-facing apartment. I can't wait to plant some window boxes in front of our place. Ooh, I'm so excited for spring! Today I ran my list of questions past Leo. After talking for a while, he offered an interesting idea. He suggested I go to Neotropical Field Site with Herb this summer to test out methods and design, then go to African Field Site next December and start my proposed research. Herb is unlikely to come to African Field Site, and Leo declares himself useless for the seed dispersal aspect of my project, so this would be a good way for me to get Herb's help in the field. -I could collect useful data and do a small research project this summer, which I am less likely to get from African Field Site because it will be the wrong season for my organisms. -Lots of similar research has already been done at Neotropical Field Site which means there is literature to build on and experienced people around. -Methods and design tried in the Neotropics might not work at African Field Site. -I'll have less time to work out logistical problems, and less of an idea what those logistical problems might be. -My 'focal organism' at African Field Site does what I want it to do in January according to the literature. If I arrive for the first time in December and find out that it is going to be impossible to work with, I'll have to find a new one and hope it is on the same schedule. I've got to run this past Herb next week. He's really concerned about getting everyone to Neotropical Field Site even without me in the picture, but I think if I can get my own funding then he'd be amenable. Leo and I talked more about what I should apply for and what I should ask for from each source. If I apply for enough grants I'm bound to get some of them. Leo asked what I was going to do with the review paper I wrote, and I told him I initially thought it might be publishable (when I came up with the topic, that is, before I wrote it), but I wasn't sure now. He said it would be perfect for Taxonomically Specific Journal (this is a made up name in case you couldn't tell) and would be a good way for me to make myself known in that community of researchers. I hadn't considered this at all so I'm glad he suggested it. I think I've gotten better at talking about my research interests and not worrying that I don't have every aspect of my research project figured out yet. I suppose what I've learned to do is say, "I don't know" with enough confidence to acknowledge the question as relevant and something I will be able to find out the answer to even though I don't know now. Does that make sense? What it boils down to is me thinking to myself, "Yes, you can do this. Don't let anyone's well-meaning, inquiring questions intimidate or discourage you." I know it has taken me years to get to this point of academic confidence, especially among 'superiors,' but I'm really proud of myself. I've got a lot of work to do over break, but Jon and I are planning to visit some museums this weekend. Neither of us is seeing family this Thanksgiving because it's a lot harder to get away from Big City without a car and we got a great offer to dog sit. Our friend from SFC invited us to have The Big Meal with her family so we're looking forward to that tomorrow. Happy Thanksgiving, everyone! I found it nearly impossible to keep my eyes open today in the required graduate class. I really was trying too, because next week I have to lead a discussion on papers in this professor's area of research. I pinched my hands and arms to no avail... I just gave myself little pink pinch marks and still looked like I was falling asleep. I felt like this yesterday too but I didn't have class. I wonder if it's my breakfast. Now that it's getting colder outside I switched from yogurt to oatmeal for breakfast. Maybe oatmeal doesn't have enough protein or fat to keep me going until lunch? Good news from today: I got feedback on my review paper and it was pretty good. Most of the weaknesses I need to address were things I was already aware of. It shouldn't be as agonizing for me to revise it as it was for me to write it in the first place. Less good news from today: I thought December was going to be primarily consumed by my two grant applications, but Chip reminded us in Population Ecology today that we have a take-home final exam equivalent to 10 normal homework assignments. Yikes! Slightly better news: We can work together like we do on homework. Still, my older and wiser office mate (who I haven't mentioned because she has kids and works mostly from home so I basically have a private office) took Pop Ecol and said the exam was killer. It will include things we haven't covered that require several desert-rodent-community-matrix-sized leaps from what we already know. I'm still behind on homework in the class so I'm going to attempt to catch up over Thanksgiving (I'll at least try them all so I will know what I don't know). While working on my curriculum vitae this afternoon I was having trouble deciding how to fit in some slightly unconventional "professional experiences" that I think merit inclusion in my new, more standardized format. I Googled "ecology curriculum vitae" to look at other people's real CVs and get ideas, but they just had the usual stuff on them. I thought maybe I was looking at people who were too old (=well established in their careers) and had long since dropped the "summer nature daycamp leader" from their CV, so I tried Googling "ecology curriculum vitae 'graduate student' " hoping to get some younger folks. Well, the CV of one of my best friends turned up in that search, and she has some pretty unusual stuff on there, but I wanted a larger sample size. Suddenly it came to me- I Googled "ecology curriculum vitae 'small friendly college' ." Bingo. Lots of people who graduated years before of me but still had "specimen preparation for mammalogy collection" on their CV, as well as their undergraduate TA experience (I wasn't sure if I should include this). I'm still not entirely sure how to present my foreign study experience. I don't really see that on many CVs. Tomorrow I'm meeting with Leo to discuss these questions further. Maybe he'll offer to fly me to African Field Site with Earthwatch funds to help with one of his expeditions... I'll keep dreaming. Sorry this post has been long and rambling. The only thing that ties these things together is that they were part of my life today. Last week in lab I told my students they should use some down time over Thanksgiving break and winter break to look for internships and summer jobs. I wish I had been encouraged earlier in my college career to consider things like Research Experiences for Undergraduates (REU) programs. I want my students to start thinking about what they can do this summer (or next summer, or the summer after) because this is the time of year to do it. REU applications are due in February or March and they've got to get it together. Plus, I hope some people will be inspired by all of the awesome opportunities out there in science, and especially in ecology since that's my particular passion. I spent a long time composing an email to my students about internships (tacked onto some housekeeping about grades so hopefully they'll read it). I linked to the REU program finder site, the Student Conservation Association (SCA) site, and heaps of internship opportunities in Big City. I did an REU program after my junior year of college. I applied to several programs but was only accepted to one in Kansas, not my first choice. It ended up being an awesome summer; I had a great roommate, experienced life in a college town, and did some cool research with someone who was a great advisor. I learned that I wasn't particularly interested in his research paradigm or system, but I did learn a lot about the process of becoming a scientist and life in academia. The typical REU stipend when I was in Kansas was $3000 for the 10 week program. They also provide housing, food, and travel reimbursement to get you there. As I was poking around REU programs for my students, I discovered the going rate for this summer is $4000 plus room and board and travel. A quick calculation tells me that this (if you assign more than $500 for the housing, food, and travel reimbursement) is more than I make as a TA in 10 weeks. I earn approximately $440 per week before taxes and have to pay rent, bills, and buy food with that. Kind of sad, really, but I'm glad the REU students can earn a decent wage for doing summer research. I think the biggest bummer about REU programs is that you can't participate the summer after you graduate. I'm an advocate of taking time off before going to grad school and an REU program would be a great thing to do during the first summer in the "real" world. Today one of my students emailed me to say she's interested in plants and wants to talk about career options and grad school. I think she was interested in pharmacy school or something at the beginning of the semester so I'm thrilled to hear she wants to talk about plants. I can't wait to tell her about all of the cool things she can do and study. I think I was the second-to-last twenty-something who went to college to not have a Facebook account (Jon still doesn't and is firmly resisting). A few weeks ago (after my younger cousin, some of my students, and several of my friends asked me if I'm on Facebook) I decided I would join after finishing the review paper draft and some other things. So, tonight, after choosing a new layout for my CV I decided it was time to join Facebook. Geeze, I hope I don't regret this. There are some people from high school who I really don't care to reacquaint myself with over the internet. I just spent the last hour choosing pictures from RFC to upload to an album. This could be a serious time waster. Maybe I should've waited until winter break? Obviously it is now late and I need to go to sleep. Last week in the core course for new grad students we had to prepare CVs for our future selves post-Ph.D. and post-doc. It was kind of fun to make up publications and decide which journals I would publish in. We also had to look for jobs we thought we would want to apply for (and that we'd be qualified for!). I found several listings for assistant professorships at liberal arts colleges that sounded good. -I had five publications from my Ph.D. While we were discussing our CVs and job searches, the prof asked how many of us published in Science or Nature. Three men raised their hands and zero women. Women outnumber men in my program 2 to 1. What's up with that? I've got some thoughts on gender and science that will appear on the blog eventually. From this exercise and discussion I decided that it is time to update the format of my CV. The format I've been using for the past several years has served me well, but I need to upgrade to a more standard format for academia. My goal is to get this done before Thanksgiving. Both of the grants I'm applying for in December need CVs so I want to get this done. 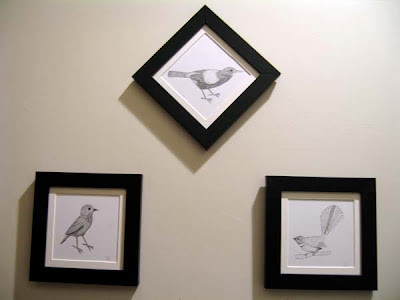 This week we finally framed and hung some of my drawings! We ordered the frames online (it's hard to find square frames) and Jon matted them. We still need to print some of the awesome photographs we took during our travels last year and get those framed. Hopefully we can get some up before Christmas. ooh! I got meme tagged! Anne-Marie from Pondering Pikaia tagged me for this meme. I'm very flattered. 3. and 4. Now that the list of bloggers that I think might read my blog, I'm tagging regular readers of my blog who I don't know. If you are from Kansas City or Toledo you are definitely tagged... hope you aren't too creeped out but Google Analytics tells me where my blog visitors are from and when they visit- I know nothing about you personally! (if you don't have a blog you can just post it in the comments section of mine if you want, or of course you can choose not to participate). I've been meaning to blog about the enormous plastic trash collection floating in the North Pacific Gyre since I first heard about it last week. How could I have possibly not heard about it before last week??? Anywho, Paulina did a nice post about the Great Pacific Garbage Patch. I turned in my review paper (10.5 double spaced pages) and only spent 9 hours at school today (although I still have at least an hour of grading to do). I should start keeping track of how many hours I spend on 'work.' I think lately it has been something disgusting like 70+ hours/week. Let's hope the trend doesn't continue. I've had a really uneventful, boring weekend. Most of it has been spent agonizing over this review paper that I have to turn in on Tuesday. I've just been dreading it. I told myself I couldn't post to the blog until I really got some traction on it. I was looking forward to this assignment at the beginning of the semester, because writing a review paper on a topic of my choice should help me develop my own research focus as I discover what's been done and what hasn't. In spite of the fact that I chose this topic, I've been dragging my feet on it all weekend. Last night I wrote four pages and today I wrote another four but I didn't really get into it until after watching The Amazing Race this evening (TAR has nothing to do with my topic, unfortunately). Part of the reason I've been unenthusiastic about this assignment is that I didn't think about it at all in the past month while I was working on my NSF GRFP application. The other reason is because... ok brace yourself for this one... I've never written a 10 page paper before (at least not that I can recall). I'm not even talking about 10 single-spaced pages- I haven't written 10 double-spaced pages. I know, right now you're thinking how could this girl have possibly gotten into grad school? What kind of deficient education did she have? I wrote review papers as an undergrad and the assignments were 8-10 pages but mine always came out on the shorter side. I never elaborate as much as I probably should. To graduate we didn't write theses but did comprehensive exams. I have done assignments with multiple parts that added up to well over 10 pages (such as my comprehensive exams and my GRFP application) but I've never written 10 cohesive pages. I blame the latent perfectionist in me that hates to do something if I can't do it perfectly right away. I've spent years accepting that I've got to make mistakes the first time around and sometimes you just need to do something even if it's crappy. So there you have it. I'm simply intimidated by the thought of writing a 10 page paper. I'm feeling much better about it now that I have 8 pages (rough as they are). Actually, I only have 4. I like to type single-spaced and then double-space it all at the end. I think its easier to see what I've already written if it covers fewer pages and I find it really satisfying to double the length of my paper just before turning it in. It is really late right now so I need to try to go to sleep. I've gotten on a weird schedule this weekend with all this procrastination. I recently had the pleasure of hearing Robert Sapolsky, author of A Primate's Memoir, speak in Big City. Sapolsky is a Neurobiologist at Stanford and author of several books. I absolutely love A Primate's Memoir. It is hands-down one of my favorite books. It makes me laugh and makes me cry like no other book has. I love reading field biologist memoirs and this is one of the best. I was SO excited when I heard Sapolsky was coming to speak. Most of his research has to do with stress and his lecture was about stress-related diseases which isn't a particular interest of mine but I knew that if his lectures were half as entertaining as his writing that it would be worthwhile. I wasn't disappointed. I brought my dog-eared copy of A Primate's Memoir for him to sign after the talk. Several people were standing around him afterwards but I managed to get him to sign my book before he had to leave. I think I rambled a little bit too much and was probably came off as a slightly over enthusiastic fan but he was very polite and took my gushing compliments of his book very humbly. Also, he still has big curly hair like the picture of him on the back cover (in case you have the book). Read his book and don't pass up a chance to see him speak. What a relief! My NSF GRFP application is done. FastLane didn't have any problems so I was able to upload my (hopefully) perfected essays this afternoon. Now I just have to wait four and half months to hear the results. And start on that 10-15 page review paper due next week. And the grants I'm applying for in December... That's why they call it Piled Higher and Deeper, right? My bike has been the last to leave the rack outside my building several nights in the past 10 days or so. I imagine I'll be last again tonight. I'm finally calling it a night after 13 hours at school. I've uploaded my essays to FastLane (NSF's site for applications) in case its overloaded tomorrow afternoon when things are due. I'm planning to do a final proofread tomorrow afternoon, but in the worst case scenario now I've got something on FastLane to submit. I'm feeling pretty good about my application. I think my plan of research and previous research essays are pretty much locked down but I still might work on the conclusion of my personal statement. I tried reworking it again this evening. Ai! I hope I get this thing. I was feeling pretty good about my NSF proposal today until I got some really unhelpful feedback from Herb about my previous research and personal statement a few hours ago. He wrote, "The research statement shows a lot of experience, but does not suggest a direction, much less the one you are taking." I think I need to sleep on it and come back to it tomorrow not freaked out. I don't have to take everyone's advice. I just discovered a new blog. Last week Pondering Pikaia was honored by Blogger as a "Blog of Note." It definitely deserves the recognition! Anne-Marie does a great job addressing science news and interesting critters. Check it out! She has a great series on Harry Potter although I haven't read much of it yet (her posts are really long! I easily spent over an hour on her blog). I hope she keeps blogging in grad school. I look forward to reading this one for quite a while. Is this the hidden essay? The page limits on each essay for the NSF Graduate Research Fellowship Program are strict and unambiguous: 2 pages (including references), 1" margins, 12 pt Times New Roman font. The only way left to fudge it that I can see might be to change the spacing to be slightly less than 1. A friend of mine applied for and got a GRF a few years ago and she wrote her plan of research in Arial Narrow. It makes a significant difference in length. List significant academic honors you have received relevant to your major field of study that are not listed above (less than 16000 characters). Sixteen THOUSAND characters! My two page personal statement is about 1,200. That means you can fit more than 25 pages of text in the field for significant academic honors! I noticed this when I applied last year too. I'm beginning to think it's a secret way for people to include more text in their application. My closest friend so far in my cohort of grad students is Mariya. She's also in Herb's lab and we TA the same class. We just always seem to end up chatting and she has come over to hang out with us a few times. I absolutely love to listen to her talk. She's from Central America and has an awesome accent. She's also really funny and she thinks I'm pretty funny so we laugh a lot. Mariya's worried about being cold in the winter since she's never really experienced one before so she wants to get warm boots, coats, sweaters, everything. People keep telling her to get long underwear but she wasn't even sure exactly what it was. I told her to buy some nylon stockings and some good warm socks. Today we went shopping at the thrift store near my house and found lots of sweaters for her for about $10. Sometimes Mariya comes into my office looking for some kind of advice or ideas about her research or something. Usually she thinks out loud, I have no idea what she's talking about, then she comes to some kind of revelation and thanks me for my help. I guess sometimes we just need someone to listen to us think. How much should I tell? Herb and I had another meeting today about my proposal, a longer one this time over dinner. Honestly I didn't expect this much attention from him about this but I think it's helping my proposal tremendously. We do have a disagreement about how NSF reviews the Graduate Research Fellowship proposals. I mentioned this in a post a few weeks ago. Herb thinks I will be disadvantaged if I tell them that I primarily want to teach when I finish my Ph.D. (preferably at a small liberal arts college, but we'll just see what happens). He's afraid that I'm unlikely to have a teaching-based reviewer and that a research-focused person reading my review won't understand why I want to teach. This is where I think Herb is out of touch. As far as I know he hasn't had any students get a NSF GRF (certainly not recently) but he has written and gotten many other NSF grants with his students. I think the GRF is a different ballgame. I'm going to post the criteria that applicants are supposed to meet in order to be competitive for this fellowship, and it includes strong emphasis on the broader impacts of your research. (3) to interpret and communicate research findings. Panelists will consider: the strength of the academic record, the proposed plan of research, the description of previous research experience, references, Graduate Record Examinations (GRE) General and Subject Tests scores, and the appropriateness of the choice of institution relative to the proposed plan for graduate education and research. Applicants may provide characteristics of their background, including personal, professional, and educational experiences, to indicate their potential to fulfill the broader impacts criterion. Each of the three application essays (personal statement, plan of research, and previous research) is supposed to address both the Intellectual Merit and Broader Impacts criteria. I think they want people like me who want to integrate research and education with undergraduates and lead community outreach programs that strengthen science education. I also plan to do significant outreach at my field site for my Ph.D. research in cooperation with a grassroots environmental organization. I'm planning to tell them these things, but Herb doesn't want me to pigeon hole myself into the liberal arts college hole and leave things more open-ended instead. I am extremely interested to hear from people who have gotten a GRF, not gotten a GRF, or been a reviewer for the GRF. What do you think?